When Danny and Sarah, Acorn’s Directors became parents they found themselves staring down into the cot like any other parent asking if their baby was OK. Since the birth of their first child, Megan in 2004 Acorn have run free infant and child training for mums and dad’s, grandparents, groups of friends and anyone else interested in learning first aid. Our courses are delivered by knowledgeable and enthusiastic trainers all of whom hold adult teaching qualifications supported by a professional qualification and considerable, hands on practical experience which is reflected in our grounded, pragmatic approach. How do we approach infant and child resuscitation training? This course is of 2 hours duration. Post course our team of consultants and trainers are available to answer any questions you might have. 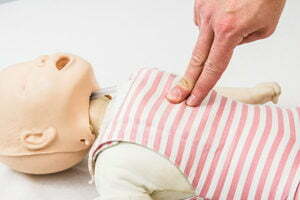 Our ‘free infant and child resuscitation’ course is just one of over 60 courses we offer. Acorn Health & Safety provides training and consultancy in first aid, fire safety, food safety, manual handling, healthcare training and health and safety.